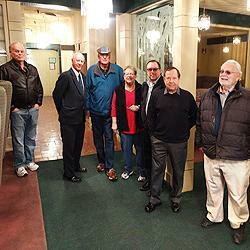 Our board welcomes you to a true showplace, about to take center stage again at last! 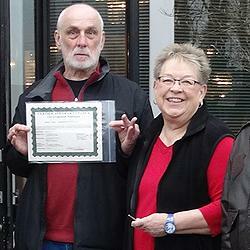 President Sue Scott, key in hand; Bob Jones with the title. Soaking up the lingering ambience of Lakewood's finest restaurant: Glen Spieth, Ed Voie, Jim Curley, Sue Scott, Jim Schell, Phil Raschke, Kris Kauffman. Even museums have a history—and Tuesday, January 22nd 2019 saw the opening of what could be the most exciting chapter yet in the ongoing story of your Lakewood Historical Society. 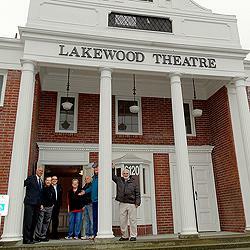 As the hands of the clock in the Lakewood Theater's elegant old tower inched toward noon, LHS President Sue Scott gathered with Vice-President Ed Voie, Treasurer Jim Curley and board members Kris Kauffman, Phil Raschke, Jim Schell and Glen Spieth to accept from Mr. Bob Jones the key and title to the Lakewood History Museum's new home. Mr. Jones presented the key in his capacity as Property Manager of Gramor Development WA LLC, the owners of Lakewood Colonial Center. In terms of distance, then, the upcoming move is more a baby step than a giant leap—Lakewood History Museum has occupied a small (not to say cramped!) storefront on the Colonial Center's south-facing side since 2006. In terms of its potential, however, the move is HUGE. After all, a world of local history permeates the very brick and mortar of the new location--an undeniable plus when siting a museum. Better yet, unlike a lot of history, this is one made mostly of fun times and fond memories. After all, who doesn't love a night out—drinks and dinner, say, at the finest restaurant in town, followed by a movie at a classy but comfortable little theater nearby? How nearby? Try next door! If you're a Lakewoodian of a certain age you'll immediately make the connection, knowing exactly where and what we're talking about. For those who need it spelled out, the Lakewood History Museum is moving into the space previously occupied by not one, but two famous and beloved institutions from our city's past—The Terrace Restaurant and the Lakewood Theater. For decades, The Terrace was THE place in Lakewood—literally, the only place—to take friends, distant relatives or clients you wanted to impress. Or to have a romantic tete-a-tete with a very special someone. Or to just fill your belly with the best grub between Olympia and Tacoma. There are many fine establishments in today's Lakewood, of course—but try to find one with a piano bar, played expertly by someone who knows all the cocktail lounge standards. 35 cent matinees showing third-run westerns or swashbucklers or jungle epics. Warnings not to sit under the balcony during teen-oriented flicks—unless the theater's combination usher/bouncer had already cleared out all the coke-spilling delinquents. The sound-proof (more or less) "cry room" set aside in the balcony, where hard-pressed mothers could comfort their babes without missing a single teary moment of "Imitation of Life" or "Madame X"... believe us, we could go on! Opening, like the rest of historic Colonial Center (first shopping center of its kind west of the Mississippi) to great acclaim in the 1930's, the Lakewood Theater's striking architecture instantly made it a much-needed icon for the sprawling, unincorporated Lakes District. In the middle of what was then the boonies, the theater benefited from a lack of competition —until the population started booming and more movie houses sprang up, adding to the usual litany of woes that eventually felled nearly all the old neighborhood cinemas: the rise of TV, the fall of the studio system, etc. By the late seventies, you could say the projector was definitely flickering, the popcorn going stale. Fitfully closing and reopening its doors in its final years as attempts were made to re-establish it as an art or revival house, the Lakewood Theater gave up the ghost for good on June 1, 1984. Since that day it has sat vacant and abandoned. But not for much longer! No mistake, much needs to be done between now and the grand opening of the new and improved Lakewood History Museum. Take a look at the canopy over its future entrance, for instance, with its beautifully carved letters that now spell “Terr R tau ant”, while inside much remains that made far more sense in a restaurant than in a space devoted to appreciating Lakewood's history from the retreat of the glaciers to present day. Of course, rooting out those old fixtures will be the easy part. Likely the Historical Society will find the only thing greater than the acquisition of this vast new space will be the effort and resources needed to make the best use of it. They'll be counting more than ever on the support of the community in general and their members in particular in this, the biggest, most challenging—and most promising—adventure the Society has ever undertaken. Whatever contributions the community is willing to make—labor, money, volunteering as docent, adding to the collections—will be appreciated now more than ever. Be sure to check back from time to time for updates on our progress.